Meat consumption down? “Renewables” surging? | J. Morris Hicks, writer. speaker. big picture guy. Meat consumption down? “Renewables” surging? Things must be getting better.—Not so fast my friend! The Evening News. Red meat consumption going down, great news about renewable sources of energy, less disease and fewer hungry people in the world than ever before. That’s what we hear on the news—so things must be getting better, right? WRONG! Meat Consumption Data. I just ran the numbers from a census.gov report (see link below) comparing the global consumption of all kinds of meat: beef, veal, pork and chicken. My findings, comparing the data for 2010 to the previous year. That is ALL the good news there is on this page! Total meat consumption in Europe went UP by 224,000 metric tons. Total meat consumption in CHINA went UP just over 2 million metric tons. Total net WORLD meat consumption went UP 6.5 million metric tons. That’s equal to an INCREASE of over 14 billion pounds—in just ONE YEAR. Our modest reductions in the USA are being wiped out by HUGE increases in the developing world. And there is no end in sight. 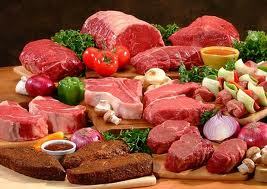 Total world meat appetite: 237 million metric tons = 521 BILLION pounds. That works out to over 72 pounds for each of our 7.2B people; a number that’s certain to keep climbing as billions of people in the developing world start eating meat for the first time. What about fish? Per the same report, the total world catch in 2008 was over 142 million tons. Up 46% from the 1990 number of 98 million tons. Total global flesh (meat & fish) consumption was roughly 379 million tons in 2010 and is almost certainly much higher today. Dr. Stephen Emmott reported in his 2013 TEN BILLION that we’ll need to double our production of food in the next 4o years. That will put us close to ONE BILLION TONS of animal/fish flesh by mid-century. Will renewables save us from global warming? What about our progress with renewables replacing the consumption of fossil fuel? Even with all the great news about solar, wind and geothermal energy, this graph paints a scoreboard that the average 3rd grader could easily understand. Steady growth since 1950. The Bottom Line. When you look at the “big picture” of the most important indicators in the world—there is NO GOOD NEWS! As our population, consumption of STUFF, and burning of fossil fuels all continue to escalate—the ONLY solution to saving our ecosystem AND our civilization—is to influence billions of people to begin urgently replacing most of their meat-based calories with healthier, plant-based alternatives. As we begin working on the “demand” side of the equation, markets will quickly respond, people will begin getting healthier, the cost of healthcare will plummet, water will become more plentiful, trees can be planted on the freed-up land and our fragile ecosystem will begin to heal. The answer? Three things. Leadership. Leadership. Leadership. 9-12-14 blogpost. Only one PRAGMATIC way to stop climate change! 2 Responses to Meat consumption down? “Renewables” surging? Does the Pope eat animal foods? You would think that everyone in the religious hierarchy would be vegans. Most of the priests I see at my local Catholic church are obese so obviously they are eating SAD.